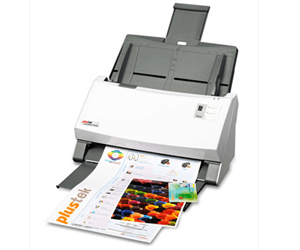 The Plustek eScan A150 will power up in an instant to give users a fast scanning solution. The 7″ built-in LCD touch screen is clear and easy to understand, even giving added functionality to review and crop images before finally saving the data to one or more file types / locations such as: USB drive, network folder, mobile, e-mail or a variety of cloud service providers. 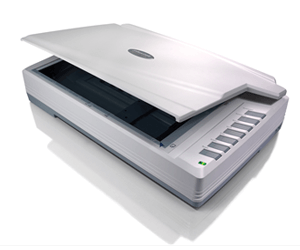 Plustek Inc., manufacturers of the Plustek OpticPro A320 scanners, describe this note worthy scanner as a a scanner capable of large format scanning with high quality performance! They go on to describe their Plustek OpticPro A320 scanner to take the pain out of large format scanning. It is USB 2.0 scanning device that can scan an A3 size document with high quality – resolution as high as 1600 dpi and scanning area as large as 12” x 17” (304.8 mm x 431.8 mm) – in just 8.5 seconds. The SmartOffice PS456U scanner from Plustek features some of the most advanced document feeding and separation systems in the Document Management sector. 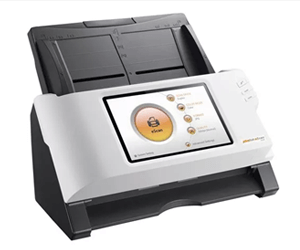 A system which allows the Plustek SmartOffice PS456U to maintain a solid level of performance whilst scanning mixed batches of various paper sizes and weights.